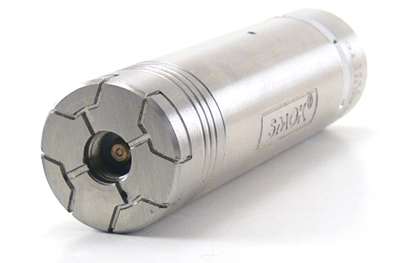 The Magneto from Smok Tech is a relatively low priced entrant in the unregulated mechanical advanced personal vaporizer market. For those new to the subject, unregulated means that the output is determined directly by the output power of the battery and mechanical refers to the fact that there is no switch, but rather a button that directly contacts the battery. If it sounds simple, that’s because it is, but Smok does a nice job of creating a good looking, smooth functioning mod from that humble design. The brushed chrome exterior has an industrial look about it which the weighty feel adds to. Design elements like dimples around the the locking collar add to the overall look without looking cheesy. The geometric design on the top cap and a spider on the bottom add a little uniqueness, but I wonder where exactly the spider motif came from. The most important design aspect is the fire button. It’s on the bottom, and pressing it makes direct contact with the negative end of the battery. The Magneto name comes from the fact that there is no spring to hold that switch open, but rather magnets that repel each other. This setup yields a nice smooth button press and also eliminates the electrical resistance caused by a spring. One of the primary reasons that mechanical mods still exist is that they streamline the electrical pathway from the battery to the atomizer so more power gets to the atomizer. The bottom of the device also incorporates an outer ring that can be screwed out until it is flush with the bottom of the button, minimizing the potential for unplanned button presses. 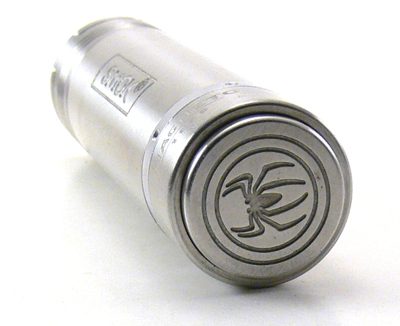 The top of the Magneto houses the common 510 fitting, making it compatible with lots of atomizers and cartomizers. On the V2 model that we tested here, the center pin is adjustable to allow further flexibility in making a good connection with a variety of atomizers. 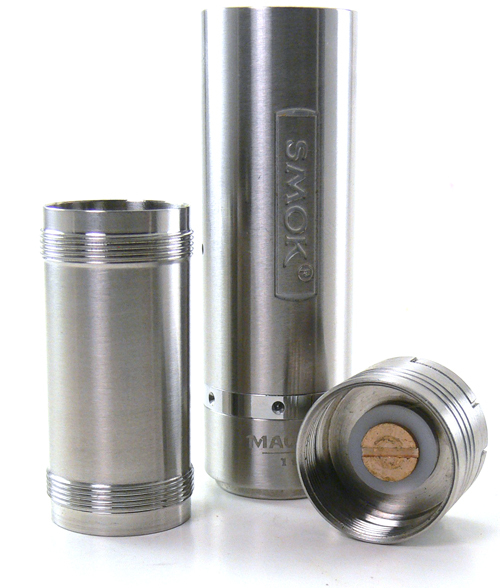 The top cap screws onto a center tube that then threads into the main body. This creates a telescoping body that will accept various sized batteries from small 18350s to large 18650s. 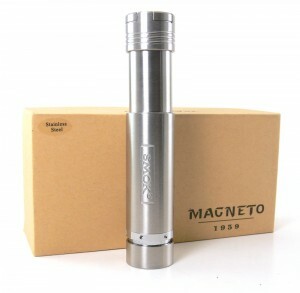 In 18350 form the Magneto has a smooth solid appearance. With the body extended to accept a larger battery it looses some of the visual appeal, but still feels good and solid. In use, there is not too much to say other than the button has a good feel to it and output is consistent. Voltage is dependent on the battery used, so a good high drain cell is recommended. The bottom button takes a little getting used to, but is easily pressed with a pinky finger. In total, the Magneto is a great inexpensive device for those looking to try a mechanical mod or even just as a standby device. It is available from Madvapes and in a beautiful brass color from Viper Vape among many other vendors.